The Experience’s second LP, Axis: Bold As Love, was released in December 1967 and again charted prominently, rising to No.5 in the UK (receiving a silver disc) and No.3 in the US, where it earned a platinum certification. Critics often overlook Axis..., but it remains a magnificent record in its own right. Predominantly gentler and more reflective than Are You Experienced, it included the exquisite ballad ‘Little Wing’, the light, jazzy ‘Up From The Skies’ and the playful, Curtis Mayfield-esque soul-pop number ‘Wait Until Tomorrow’, as well as the sturdy rocker ‘Spanish Castle Magic’, which became a staple of Hendrix’s live set. Arguably its finest moments, however, were the acid-fried blues of ‘If Six Was 9’ and the astonishing titular song, which featured one of Hendrix’s most show-stopping guitar solos and an innovative use of flanging (akin to that previously used on The Small Faces’ ‘Itchycoo Park’) on the song’s drum track. For all the trials and tribulations, however, critics and fans alike agreed that Electric Ladyland was Hendrix’s unparalleled masterpiece. A record of staggering virtuosity, it featured everything from the monster heavy rock of ‘Voodoo Chile (Slight Return)’ to the New Orleans-style R&B of Earl King’s ‘Come On’, the urgent social commentary of ‘House Burning Down’ the aquatic jazz of ‘1983... (A Merman I Should Be)’ and even Noel Redding’s hooky, proto-Britpop number ‘Little Miss Strange’. One of the most stunning debuts in rock history, and one of the definitive albums of the psychedelic era. On Are You Experienced?, Jimi Hendrix synthesized various elements of the cutting edge of 1967 rock into music that sounded both futuristic and rooted in the best traditions of rock, blues, pop, and soul. It was his mind-boggling guitar work, of course, that got most of the ink, building upon the experiments of British innovators like Jeff Beck and Pete Townshend to chart new sonic territories in feedback, distortion, and sheer volume. It wouldn't have meant much, however, without his excellent material, whether psychedelic frenzy ("Foxey Lady," "Manic Depression," "Purple Haze"), instrumental freak-out jams ("Third Stone from the Sun"), blues ("Red House," "Hey Joe"), or tender, poetic compositions ("The Wind Cries Mary") that demonstrated the breadth of his songwriting talents. Not to be underestimated were the contributions of drummer Mitch Mitchell and bassist Noel Redding, who gave the music a rhythmic pulse that fused parts of rock and improvised jazz. Many of these songs are among Hendrix's very finest; it may be true that he would continue to develop at a rapid pace throughout the rest of his brief career, but he would never surpass his first LP in terms of consistently high quality. Jimi Hendrix's third and final album with the original Experience found him taking his funk and psychedelic sounds to the absolute limit. The result was not only one of the best rock albums of the era, but also Hendrix's original musical vision at its absolute apex. When revisionist rock critics refer to him as the maker of a generation's mightiest dope music, this is the album they're referring to. 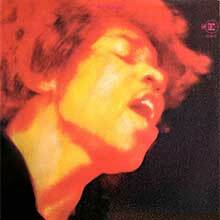 But Electric Ladyland is so much more than just background music for chemical intake. 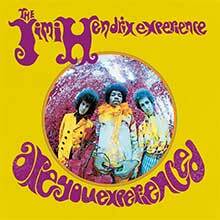 Kudos to engineer Eddie Kramer (who supervised the remastering of the original two-track stereo masters for this 1997 reissue on MCA) for taking Hendrix's visions of a soundscape behind his music and giving it all context, experimenting with odd mic techniques, echo, backward tape, flanging, and chorusing, all new techniques at the time, at least the way they're used here. 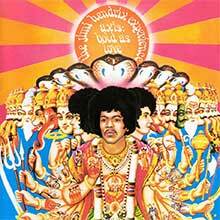 What Hendrix sonically achieved on this record expanded the concept of what could be gotten out of a modern recording studio in much the same manner as Phil Spector had done a decade before with his Wall of Sound. As an album this influential (and as far as influencing a generation of players and beyond, this was his ultimate statement for many), the highlights speak for themselves: "Crosstown Traffic," his reinterpretation of Bob Dylan's "All Along the Watchtower," "Burning of the Midnight Lamp," the spacy "1983...(A Merman I Should Turn to Be)," and "Voodoo Chile (Slight Return)," a landmark in Hendrix's playing. With this double set (now on one compact disc), Hendrix once again pushed the concept album to new horizons. Jimi Hendrix's second album followed up his groundbreaking debut effort with a solid collection of great tunes and great interactive playing between himself, Noel Redding, Mitch Mitchell, and the recording studio itself. Wisely retaining manager Chas Chandler to produce the album and Eddie Kramer as engineer, Hendrix stretched further musically than the first album, but even more so as a songwriter. He was still quite capable of coming up with spacy rockers like "You Got Me Floating," "Up from the Skies," and "Little Miss Lover," radio-ready to follow on the commercial heels of "Foxey Lady" and "Purple Haze." But the beautiful, wistful ballads "Little Wing," "Castles Made of Sand," "One Rainy Wish," and the title track set closer show remarkable growth and depth as a tunesmith, harnessing Curtis Mayfield soul guitar to Dylanesque lyrical imagery and Fuzz Face hyperactivity to produce yet another side to his grand psychedelic musical vision. These are tempered with Jimi's most avant-garde tracks yet, "EXP" and the proto-fusion jazz blowout of "If 6 Was 9." Band of Gypsys was the only live recording authorized by Jimi Hendrix before his death. It was recorded and released in order to get Hendrix out from under a contractual obligation that had been hanging over his head for a couple years. Helping him out were longtime friends Billy Cox on bass and Buddy Miles on the drums because the Experience had broken up in June of 1969, following a show in Denver. This rhythm section was vastly different from the Experience. Buddy Miles was an earthy, funky drummer in direct contrast to the busy, jazzy leanings of Mitch Mitchell. Noel Redding was not really a bass player at all but a converted guitar player who was hired in large part because Hendrix liked his hair! These new surroundings pushed Hendrix to new creative heights. Along with this new rhythm section, Hendrix took these shows as an opportunity to showcase much of the new material he had been working on. The music was a seamless melding of rock, funk, and R&B, and tunes like "Message to Love" and "Power to Love" showed a new lyrical direction as well. Although he could be an erratic live performer, for these shows, Hendrix was on -- perhaps his finest performances. His playing was focused and precise. In fact, for most of the set, Hendrix stood motionless, a far cry from the stage antics that helped establish his reputation as a performer. Equipment problems had plagued him in past live shows as well, but everything was perfect for the Fillmore shows. His absolute mastery of his guitar and effects is even more amazing considering that this was the first time he used the Fuzz Face, wah-wah pedal, Univibe, and Octavia pedals on-stage together. The guitar tones he gets on "Who Knows" and "Power to Love" are powerful and intense, but nowhere is his absolute control more evident than on "Machine Gun," where Hendrix conjures bombs, guns, and other sounds of war from his guitar, all within the context of a coherent musical statement. The solo on "Machine Gun" totally rewrote the book on what a man could do with an electric guitar and is arguably the most groundbreaking and devastating guitar solo ever. These live versions of "Message to Love" and "Power to Love" are far better than the jigsaw puzzle studio versions that were released posthumously. Two Buddy Miles compositions are also included, but the show belongs to Jimi all the way. 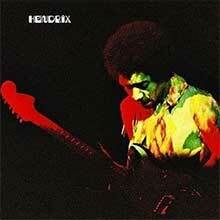 Band of Gypsys is not only an important part of the Hendrix legacy, but one of the greatest live albums ever. These are the recordings that Jimi Hendrix made for BBC radio in the late '60s. As such, they're loose, informal, and off-the-top-of-his-head improvisational fun. These versions of the hits "Foxey Lady," "Fire," two versions of "Purple Haze," and "Hey Joe" stay surprisingly close to the studio versions, but the tone of Hendrix's guitar on these is positively blistering and worth the price of admission alone. There's also a lot of blues on this two-disc collection, and Hendrix's versions of "Hoochie Coochie Man" (with Alexis Korner on slide guitar), "Catfish Blues," "Killing Floor," and "Hear My Train A-Comin'" find him in excellent form. 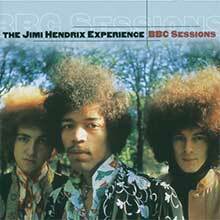 But perhaps the best example of how loosely conceived these sessions were are the oddball covers that Hendrix tackles, including Stevie Wonder's "I Was Made to Love Her" (featuring Wonder on drums), Dylan's "Can You Please Crawl out Your Window?," The Beatles' "Day Tripper," and, in recognition of his immediate competition, Cream's "Sunshine of Your Love." No lo-fi bootleg tapes here (everything's from the original masters and gone over by Eddie Kramer), the music and sound are class-A all the way, making a worthwhile addition to anyone's Hendrix collection.